Candlelight Dinner will be held on February 7, 2019. Doors open at 5:30 p.m. in the Great Room of Prescott Hall, and dinner will be served at 6:00 p.m. In October 1909, Ernest and Lewis Eaton had hoped to welcome students to their new educational venture, Billings Polytechnic Institute (BPI), the first postsecondary institution in Billings and current site of Rocky Mountain College. Unfortunately, construction delays forced them to postpone the opening. During the fall of 1909, students took classes downtown until the buildings could be finished. In January 1910, the campus was finally ready, and students, faculty, and staff loaded hay wagons and made their way up 27th Street, along the canal, to RMC's current location. They arrived cold, tired, and hungry; when they went to the dining hall for dinner, they discovered that the electricity had not been turned on so they ate their first meal on campus by candlelight. While it was not the most pleasant meal, the students decided it was an event worth commemorating. 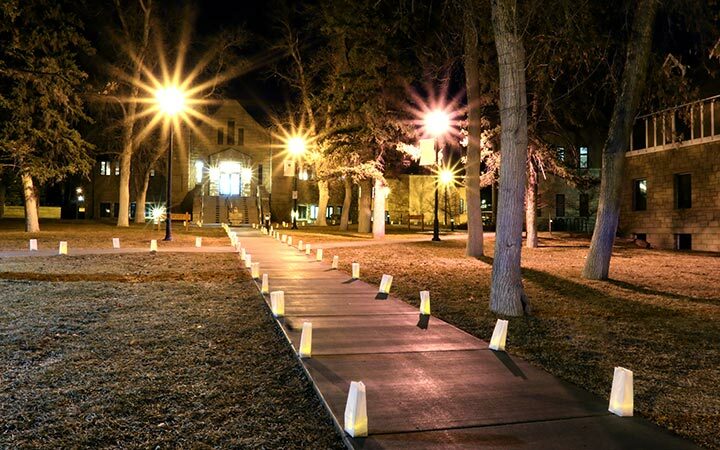 Rocky Mountain College has celebrated the Candlelight Dinner every winter since 1910. Hail Montana's skies of blue. The college we love best. Thy fair campus we adore. College of the Open Door.